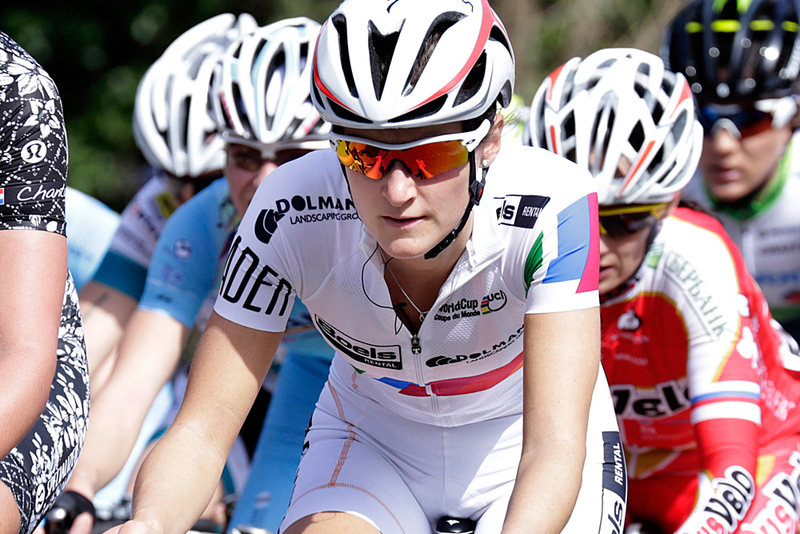 Lizzie Armitstead (Boels-Dolmans) finished second in the uphill sprint to win the Trofeo Alfredo Binda behind Emma Johansson (Orica-AIS) this afternoon, but retains her place at the top of the World Cup standings going into next week’s third round, the Tour of Flanders. “I started my sprint too late,” she told Cycling Weekly after the finish, before apologising to the team mates she credits so much for the performance. Swede Johansson was feeling confident before at the start and the offensive race she predicted certainly materialised. Eventually a strong group of six riders, representing most of the big teams escaped the clutches of the peloton after 47 of the 123 kilometres. Despite building a lead which topped out at 40 seconds, they were only allowed freedom for one of the five 17 kilometre laps of the hilly finishing circuit before being caught. Other breaks came and went, with Armitstead’s team mate, Megan Guarnier extremely active throughout, before on, the last climb nine riders escaped to contest the final. The result confirms Armitstead’s season long form before her main target of the early season at Flanders next week, where she will come up against Johansson again, as well as some of the other favourites racing at Gent-Wevelgem today, where American Kelly Hall of the Optum p/b Kelly Benefit took the honours.